Last night I had some friends over for a couple games of Rex: Final Days of an Empire by Fantasy Flight Games. 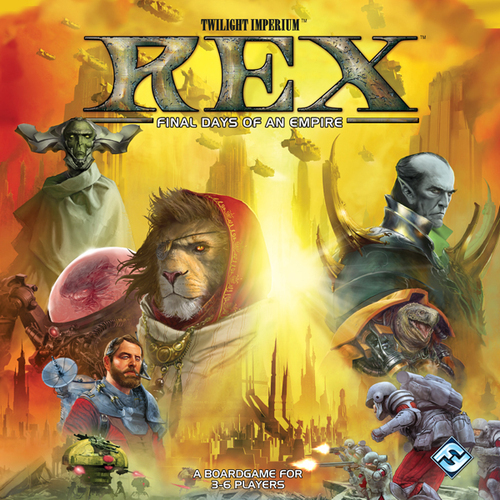 This game is set 3000 years before Twilight Imperium (another game I'd like to some day play). This game is a reimagined version of an old Avalon Hill game, Dune. The players assume 1of 6 races vying for control of the Imperial capital. The goal is to assume control of a number of key city sectors. At it's heart it's essentially a game of conquest. The game is pretty simple and can be explained adequately in a couple minutes even if one of your players is drunk. The game is made for 3-6 players, we had 4. I really would like to try it with 6 as I think it should be played with 6. It's been a while since I've posted so I thought I'd post up something. Work has been insane crazy busy so I haven't got almost anything done in regards of miniature painting. I also haven't got much accomplished in the way of board gaming either. I think I'm in a bit of a gaming funk or maybe it's more of a milieu funk as I can't seem to read anything either. Oh well... . Looking back on my New Years resolutions, I had set myself a target of getting 350 figs painted this year. It's been 5 1/2 months and I barely have a quarter done, so I think I can safely say I've blown that resolution. I am slowly working on a couple bases of Teppo for my Samurai army. When I'm done these two bases I might take a break and shift to something else for a little bit. Not sure yet. Maybe I'll knock off some Full Thrust ships or start on my 15mm sci-fi alien faction. Earlier this month we had our club's annual convention, MayDay. I ran a game of War Rocket, pitting a Galacteer force on a mission to destroy an Imperial asteroid base. The game generally went off without a hitch and ended in an Imperial victory due to some odd decisions on the part of the Galacteer player. I like this ruleset as it's quick and easy to explain/learn. Yesterday Chris and I gave a run through of a 15mm sci-fi battle using FUBAR. We used the basic rule sheet and the Armored Vehicle rules from the Imperial Commander sheet. The rules were okay I guess, there's a lot they didn't have. The vehicle combat rules from the IC sheet are an utter disaster as they make a vehicle virtually unkillable. Our game was almost finished when we switched back to the basic vehicle rules. Overall we weren't impressed. And it uses d6 and you know how I looooove d6's! We're going to try Stargrunt II next. Chris is reading the rules and I'm on chit duty. For boardgaming I haven't played nearly enough and I think I'm suffering from board game withdrawal. Our Descent campaign isn't going very well and I honestly don't think it's going to end very nicely. We'll see.